Newsarama did a page-by-page summary of Blackest Night #1. If you didn’t get a chance to read the issue, there are some nice moments related to Ronnie Raymond. IGN featured a really great interview with Geoff Johns about Blackest Night. Firestorm is mentioned in the interview. Can’t wait for the DC Direct Black Lantern Firestorm action figure? Then check out this custom action figure selling on eBay right now. My thanks to ComicByComic.com for originally drawing my attention to this. The San Diego Comic Con has started and at least three Firestorm-related creators will be there: Jamal Igle, Dwayne McDuffie, and Geoff Johns. If you’re going to the Con, be sure to attend one of the panels for these guys and tell them how much you love Firestorm! If you haven’t been keeping up with Justice League of America, Jason Rusch/Firestorm recently met the Shadow Thief. For those of you who don’t remember, Shadow Thief is the one who killed Ronnie Raymond/Firestorm. Luke over at Being Carter Hall published a fantastic page from JLA where Shadow Thief gets some payback from Firestorm. If you like trivia, check out the Firestorm trivia thread over at the DC Comics Message Board. Please feel free to chime in and join the fun! 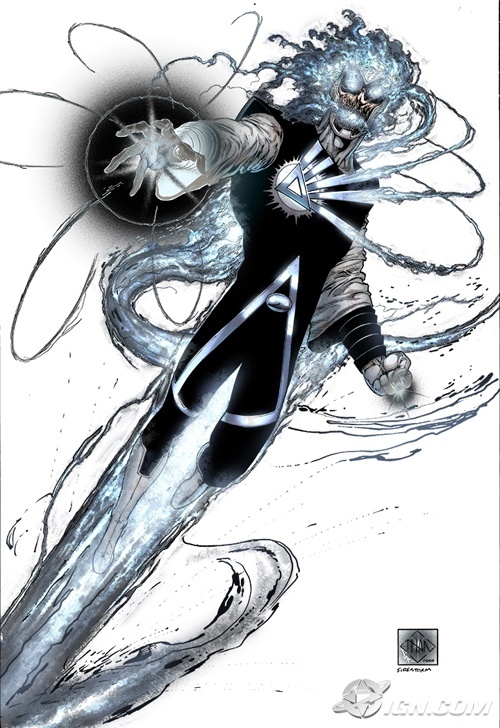 Finally, DC has released a new Firestorm Black Lantern sketch by Ethan Van Sciver. Enjoy! Posted in: Blackest Night, Comic books, Dwayne McDuffie, Ethan Van Sciver, Firestorm #07: Jason post-Infinite Crisis, Geoff Johns, Gerry Conway, Jamal Igle, Jason Rusch, Justice League of America, News, Ronnie Raymond.